Meals on Wheels (Ottawa) celebrates March for Meals and 50 years of service! 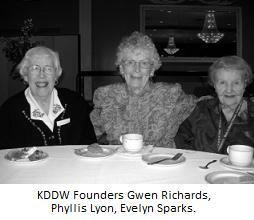 Fifty years ago this month Meals on Wheels in Ottawa made its first deliveries. Founded in 1968 by the Ottawa City Union of The International Order of The King’s Daughters and Sons, the program delivered 29 hot meals to 15 people at a cost of 75 cents per meal during the first week of operations. In the early years, all involved were volunteers who saw a need and filled it. It was a service founded on compassionate members of the Ottawa community. True champions for Meals on Wheels! What better time to announce this important milestone of 50 years and to celebrate the impact of the Meals on Wheels Service in Central Ottawa than during the March for Meals Community Champions Week. Held from March 19-23, 2018, this year’s local event was organized by the Champlain Meals Delivery Service Network in conjunction with the Ottawa Meals on Wheels Network and the Meals on Wheels programs throughout Eastern Ontario. During the campaign, our Community Champions have been out delivering meals alongside volunteers who faithfully support our programs all year long. In doing so, they helped draw attention to this vital service provided to vulnerable seniors and adults with disabilities. This annual campaign aims to bring awareness to the challenges our client population faces when meeting their nutritional needs. It’s also the perfect opportunity to highlight the work that our programs do in providing, not only hot and frozen meals, but an important volunteer contact and security check. It really is “More than just a meal”. Here in Central Ottawa, we had a very special individual join us for March for Meals Community Champions’ Week. 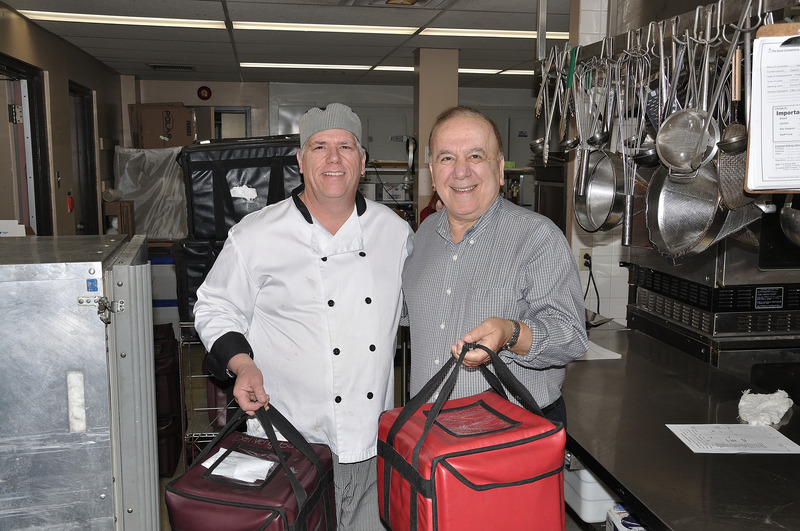 Donna and Moe Atallah then joined Mr. St-Cyr as they headed out to bring hot meals to clients in the civic hospital neighbourhood. Being a Champion for Meals on Wheels is not new for Moe. He has been a friend and supporter of the program for a very long time. 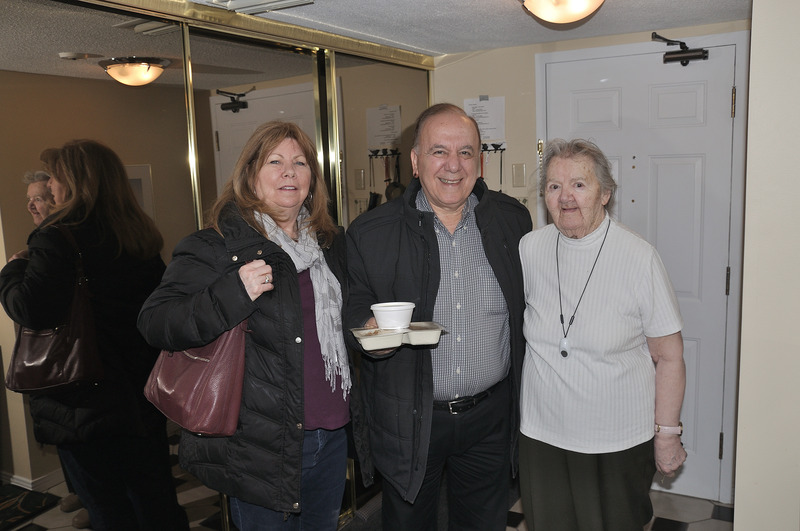 For more than 20 years Moe Atallah hosted annual Christmas dinners, feeding upwards of 2000 people on Christmas day including providing turkey dinners for Meals on Wheels clients delivered at home by our volunteers. When Moe had to downsize his business in 2013 and could no longer accommodate serving this large crowd on Christmas Day, he nevertheless remained committed to Meals on Wheels. Every year on December 25th Meals on Wheels staff members and volunteers join Moe Atallah and his team at the Newport Restaurant to cook, pack and deliver a turkey dinner with all the fixings to clients some of whom might otherwise be alone. Moe understands the importance of this meal for the clients who receive it and has assured us many times that, “come what may, Meals on Wheels will always have a home at The Newport Restaurant on December 25th”. After all these years preparing food, Moe was thrilled to get a chance to knock on the door and deliver a meal right into a senior’s hands. He and his wife Donna had a chance to meet Mme Jacqueline Grujic as they delivered her hot lunch. Mme Grujic has been a client of Meals on Wheels for over 10 years. Six days a week, volunteers just like Moe, knock on her door with a smile and a hot meal. According to her family, opening the door to that volunteer, is the “centre of her day.” She worked hard her whole life looking after her family and now she loves being served. She enjoys the food and it’s a real treat. She especially loves the visit on Christmas day and the special meal prepared by Moe Atallah and his staff at the Newport. She wouldn’t miss it! She is grateful for the service and is thankful to all the volunteers at Meals on Wheels who help keep her independent in her own home. The findings of a study conducted in 2015 by Brown University’s Center for Gerontology and Healthcare Research confirms what we have all known anecdotally for decades: that Meals on Wheels programs do, in fact, deliver much more than just a meal! Volunteers provide not only the nutritional support of a meal, but also a critically important friendly face and security check. In other words, the social contact we know is vital to good health. This service helps to keep our clients independent and at home, reducing reliance on emergency rooms, hospitals and long term care facilities. In addition to drawing attention to this vital service, the March for Meals Community Champions Week campaign is also meant to help recruit new volunteers to the program. At Meals on Wheels (Ottawa) 454 dedicated volunteers helped to drive and deliver 120 348 meals to 1356 clients last year. A long way from the 29 meals delivered on that first day in 1968! Our very busy program requires a large number of volunteers to make it successful. We simply could not do what we do without the wonderful team of dedicated individuals who drive and deliver meals by car and by bike, help in the office and on projects as well as serve on our Board of Directors. Each and every one of our team is a Meals on Wheels Community Champion! There are many opportunities to help and we’d love to hear from you. Join our team of Meals on Wheels volunteers! Bringing awareness to the program is also a way to let the community know that we need their financial support. Our annual fundraising goals helps us to keep the cost of the meal as low as possible for our clients and keeps our program serving those who need it most. Join Moe Atallah and all the dedicated volunteers in showing that you are a Community Champion! Take this opportunity to learn more about Meals on Wheels, and to spread the word among family and friends. Now is also a great time to make a donation, or become one of our wonderful volunteers! Lastly, reach out to your local leaders and decision-makers to show your support for this important service.